Let’s be real about what Miss Lily’s is. It’s the Jamaican Cracker Barrel. And that’s not a rip, we love Cracker Barrel. They’re the “Get Busy” era Sean Paul of restaurants, remixed by Major Lazer for 2014 with perfect branding and social media presence. Miss Lily’s has built an accessible brand of juice, jerk chicken, and rum punch that’s fun for the whole family, assuming your family is made up entirely of Instagram-obsessed urban skateboarders. 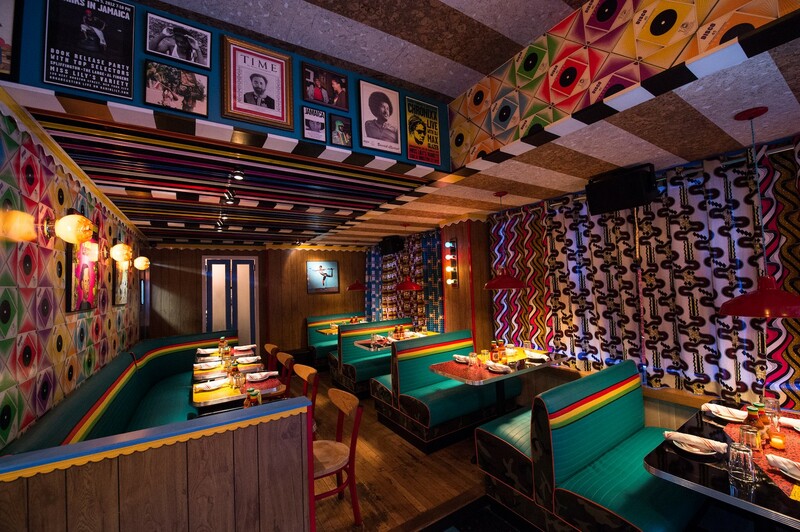 They jack the reggae-electro beats high and cover the walls with colorful old vinyl and Jamaican concert posters. The room itself brings back memories of that one drug dealer’s lair from college, minus the black lights and lava lamps. It may all sound like a horrible cacophony of absurdity, but it works because Miss Lily’s has more downtown swag than anyone, and it’s a no bullsh*t good time. Plus, this food is way better than it needs to be. Miss Lily’s has ramped up the expansion game of late, popping up in the Dream Hotel, and now in the East Village, where they’ve taken over the space that housed local favorite 7A for decades. They’re serving the same jerk chicken and coconut-covered corn that they do at the original Miss Lily’s, and we’re happy to report that the new one doesn’t miss a beat. We wouldn’t be surprised to see this expansion kick into high gear soon - LA, Miami, Montauk - this concept works everywhere and would be even better by a beach. Grilled corn on the cob, drenched in butter, aioli, and shredded coconut. You’re going to need some extra napkins. One of their specialties, and they do it well. The shrimp are super crisp and juicy, and the pepper sauce is bold and delicious. A potent Jamaican dip somewhere in between guacamole and ranch. Really tasty. Great to share for the table while you’re taking down pitchers of Sailor Jerry rum punch. Fantastic fried fish balls. We’re not sure exactly what makes these so good, but they are extra crispy and all kinds of delicious. BBQ wings with all kinds of Miss Lily’s tasty jerk flavor. These should obviously be on the table. Generally speaking, fish, aside from shrimp, should be avoided at Miss Lily’s. We keep trying and always come away unsatisfied, like with these tiny jicama fish tacos. There’s nothing to them. Bland, boring, and small. Oh yes, you need some of this oozing meat sandwich. We loved their take on the classic patty melt, and the fries are no joke either. If you come to Miss Lily’s and you’re not a vegetarian, jerk chicken is what you need to order. The chicken is slow-cooked, then finished on the grill, and the jerk sauce is good enough to bottle. They also offer jerk shrimp, pork, tofu, and salmon in their jerk shop. All are good options. A Miss Lily’s classic. This is a heavy, unsexy plate of darkness, but that doesn’t mean it doesn’t taste good.